Material: Kraft Adhesive paper. Qty12pcs on 1 sheet,1lot=10sheets=120pcs little sticker. Size:about 42 33mm each single. Material Paper. Color As picture show. The actual color may be a little difference from the picture. Color:as pics. Size:3.5 6cm(W H). We will reply you ASAP. Adhesive Or Not: Yes. Function: Decoration. Feature: Self-Adhesive. 46pcs (one box) stickers. 1 Box of Sealing Sticker(46Pcs). Material: Paper. Due to the light and screen setting difference, the item's color may be slightly different from the pictures. Rate (item arrived). Function : Use for album,diary book,scrapbooking etc. Pattern: Plants. Pakage includes : 45 x paper sticker. Material: vellum paper. It will fit your notebook more and won't make your notebook look thick and bulky. Directly tear off the sticker. Use them to decorate your notebook. 28 pieces stickers in pvc bag. So cute 46 pieces flower stickers. These stickers are made of Glossy self-adhesive paper, The surface feels very smooth, the paper is not particularly thick, and it can fit your notebook well. They are not waterproof stickers. So cute 46 pieces tree stickers. These stickers are made of Glossy self-adhesive paper, The surface feels very smooth, the paper is not particularly thick, and it can fit your notebook well. They are not waterproof stickers. Quantity 52pcs. Design: 3 designs as the picture. 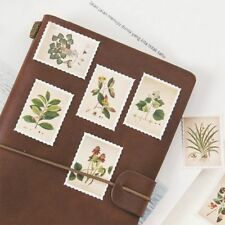 These stickers are made of Glossy self-adhesive paper, The surface feels very smooth, the paper is not particularly thick, and it can fit your notebook well. 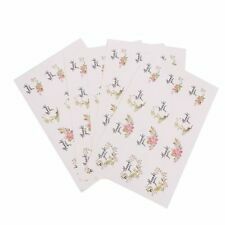 So cute 45 pieces flower stickers. They are not waterproof stickers. Beautiful lotus pattern washi stickers. They are not waterproof stickers. The paper is very thin and fits your notebook very well, so your notebook doesn't look very thick. New in pvc bag. We will wrap them into yellow bubble bag for you. Design: 3 designs as the picture. Adhesive Or Not: Yes. Feature: Self-Adhesive. But washi paper is thinner than vellum paper. 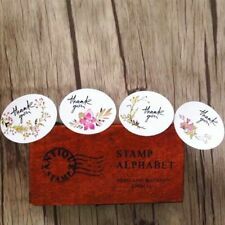 So nice retro style flowers washi stickers. Material: washi paper. Directly tear off the sticker. Use them to decorate your notebook. Self-adhesive stickers. STRIP IS 6 1/2" x 2" WITH COLORFUL MICRO FLOWER STICKERS FOR SCRAPBOOK PAGES, CARDS OR ANY PROJECT. (1)The sticker is very thin, so you have to be patient when you peal it off. You can use the utility knife. If you have a beautiful long nail, you don't have to worry about the sticker being difficult to peal off.